A. What is key control? 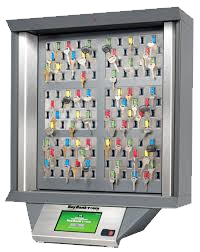 Key control and management systems are an orderly and secure solution for addressing controlled usage and safekeeping of mechanical keys. The tamper-proof systems are designed so that only authorized users, using pre-programmed PIN codes, access cards or biometrics, can access keys and on-board advanced technology automatically records all access activity. B. Why do I need it? Today’s key control and management systems have become a higher level management tool for effectively addressing the security of the dealership’s assets. Knowing the identity of authorized key holders, which keys they have in their possession or have access to and when they were used is all essential information needed to help ensure a safe and secure environment. C. Where can I use it? Key management systems have become an operational necessity in environments such as dealerships because of the measurable benefits of enhanced security, convenience, increased staff productivity and accountability.